Automation Rules for Shared Mailbox work like Gmail filters. Through Automation Rules you can create workflows which will perform actions when certain conditions are met. The Automation Rules are specific to a Shared Mailbox and work on all the emails that arrive in that Shared Mailbox. You can create an Automation Rule that will assign emails from a Shared Mailbox to a particular user when certain conditions are met. The email will move from the 'Unassigned' section and get assigned to the user. eg the rule can specify that whenever the word 'billing' is present in the body of the email then it should get assigned to Peter. 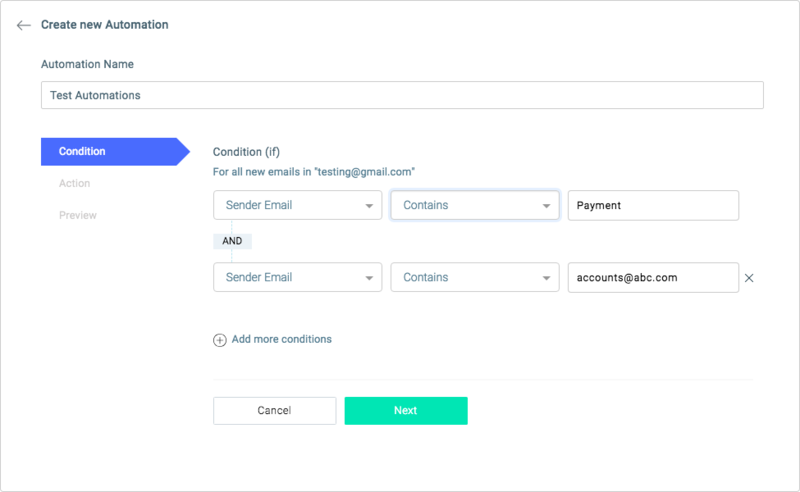 You can create an Automation Rule such that when certain conditions are met then the email gets 'Closed' automatically and moves out from the 'Unassigned' section. eg whenever the word 'unsubscribe' is present in the subject of an email, then change its status to 'Close'. This is a very interesting usage. This takes care of your email assignments by distributing them equally within the users of the Shared Mailbox. Here you can create an Automation Rule where selected emails get assigned to users of the Shared Mailbox in a Round Robin manner. Ex, whenever an email comes with the word 'payment' in its subject then the first one should get assigned to a user A, second one to user B and so on, where user A, B are users of the Shared Mailbox. Excluding any user from assignment is not possible. Tags are associated with Shared Mailboxes which help you organize your emails by categories. 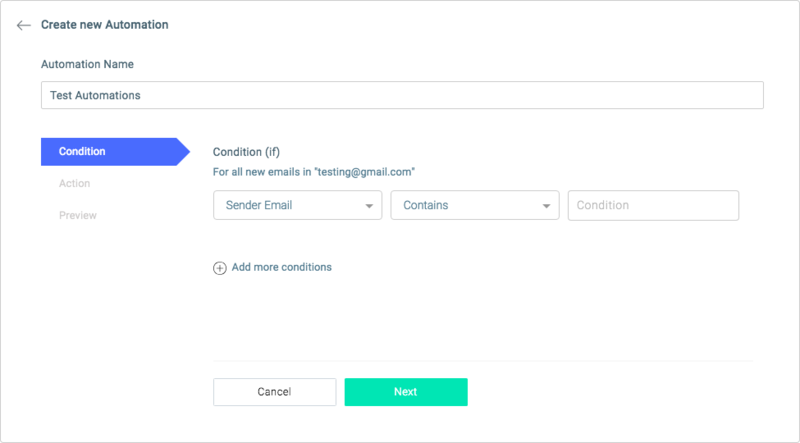 You can create an Automation Rule which will mark emails with a certain tag when certain conditions are met. For example, whenever an email comes from 'john@abc.com' the email should be marked with the tag 'Lead'. Name : You should provide a unique name for every Automation Rule that you create. The name should be meaningful, which will help you to identify what the Automation Rule will do. 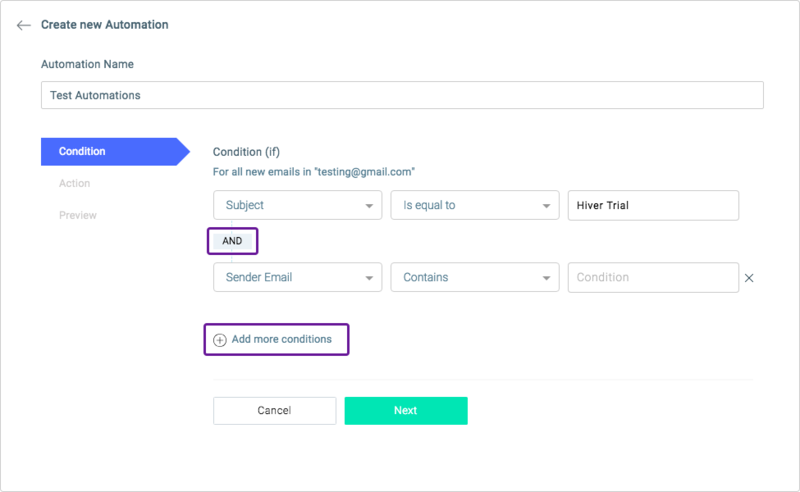 Conditions : You can enter conditions/ selection criteria for the emails in Shared Mailbox based on which the emails will be selected. Preview : This will be automatically generated by Hiver. This will show the entire rule that you have created, so that you can review it and make changes if you want to. Click on the 'Participants' tab to view the list of participants on that Shared Mailbox. Go to the Hiver Admin panel. Click on the 'Shared Mailbox' tab to see the list of Shared Mailboxes on your Hiver account. Click on the 'gear' icon on the extreme right of the Shared Mailbox for which you want to set the Automation rule. Click on the 'Automations' tab on the settings page that has opened. Click on “Create new Automation” button. After entering a name for the rule, you’d first have to select a condition which the rule checks for. You can have the rule check for multiple conditions to be met before it is activated. Please scroll down for details. In the next step, choose the action to be taken by the rule. Proceed, and in the next step, Save and Activate the rule. Proceed to create an Automation Rule as given in the section above. In the Actions page choose the option 'Round Robin Assignment' in the 'Assign to User' drop down. You can combine multiple criteria using AND operators. AND operator : You can use this operator to combine two conditions when you want the first condition as well as the second condition should be true for an email to get selected. ex. You want an email to be selected if it is coming from anyone with a @hotshot.com id and having the word 'urgent' in the subject line. 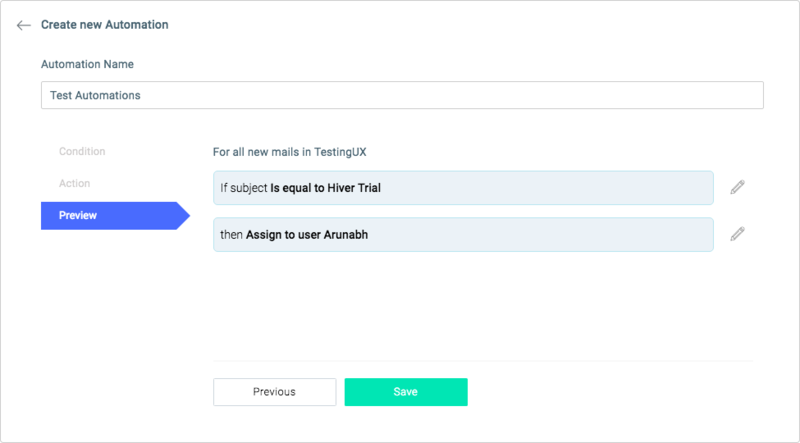 When you want to select an email when either of the two conditions is true then create two separate Automation Rules for the same Shared Mailbox. Automations are available for Premium and Enterprise plans. Automations work only for new emails that arrive in the Shared Mailbox after the automation is set up. Automations do not work on emails added to the Shared Mailbox manually using the “Add to Shared Mailbox” button. If you set up a rule to check for multiple conditions, it will require ALL of those conditions to be met. If an email meets the conditions required by two different automation rules, then both the automation rules will be applied on the email one after the other in the same sequence that they were created. 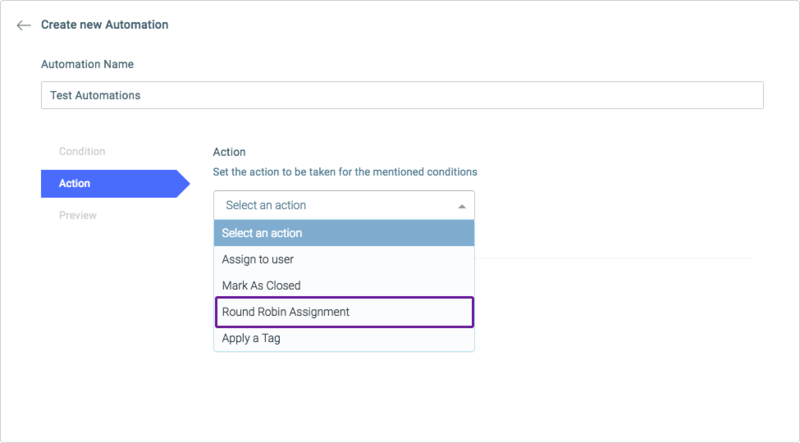 You can use an automation rule to set up ’round robin’ assignments. If you do that, Hiver will automatically assign emails to the uses added to the Shared Mailbox, one by one. In case an email is sent from the Shared Mailbox id, then the automation rule will be applied only on the first incoming email. Click on the 'trash' icon on the right of the Automation Rule that you want to delete.